LiteHawk CHARGER 2 is a sleek, low profile, twin hull racing boat that follows the design look of classic Off-Shore Racing Crafts!The Motor, ESC and Receiver are all water cooled - protecting them from overheating! This is super important as everything is tightly sealed within the hull - hey, it gets hot in there! The twin-hull design of the CHARGER 2 lifts the boat out of the water at high speed - allowing it to ride on a cushion of air, increasing top speed right up to 25km/h! 2 Channel Fully Digital 2.4 Ghz Control puts you in the Captains Seat! Play together with up to 80 models at the same time without the fear of losing connection! Factory Assembled and Ready for You! Water Resistant Top Cover uses a simple yet very strong twist tab - no need for complicated latch systems. Boat Display Stand Included - perfect for showing off your new pride and joy! Rechargeable NIMH Battery and Wall Mount Charger Included. Remote controller requires 1 9V battery not included. 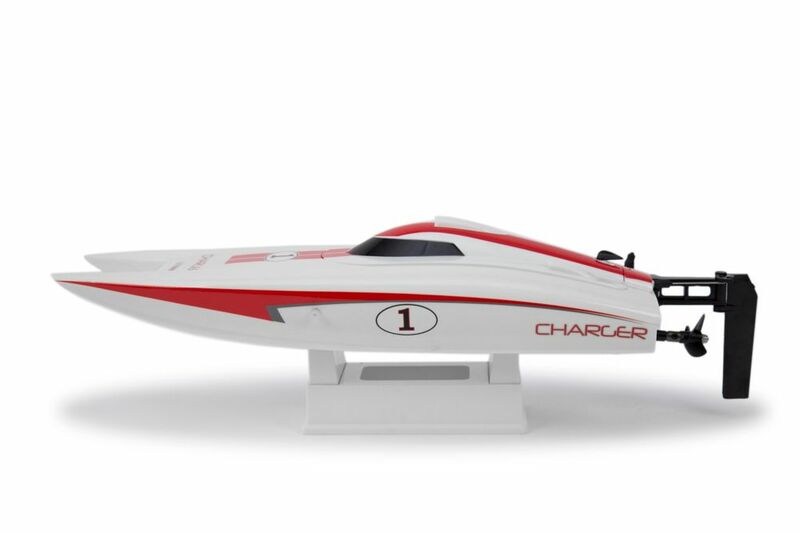 Radio Controlled Charger 2 speed boat LiteHawk CHARGER 2 is a sleek, low profile, twin hull racing boat that follows the design look of classic Off-Shore Racing Crafts!The Motor, ESC and Receiver are all water cooled - protecting them from overheating! This is super important as everything is tightly sealed within the hull - hey, it gets hot in there! The twin-hull design of the CHARGER 2 lifts the boat out of the water at high speed - allowing it to ride on a cushion of air, increasing top speed right up to 25km/h!